We finally got around to making our nature table. 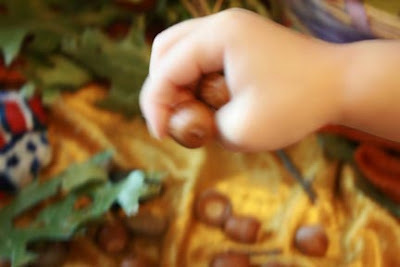 We don't have trees in our yard, so we picked up leaves and acorns at a park one afternoon between trips down the slide. The smooth rocks were put in Abigail's stocking last year by Santa Claus. She has ten and enjoys playing with them. The painted rocks are from a painting session we had at my Mama's house in August. Abigail and I hunted all over their "farm" for just the right rocks (which are quartz and granite in Georgia - in Kentucky we mostly have limestone), and my mom had some acrylic paint. Mama, my sister-in-law, Abigail and I painted all afternoon. 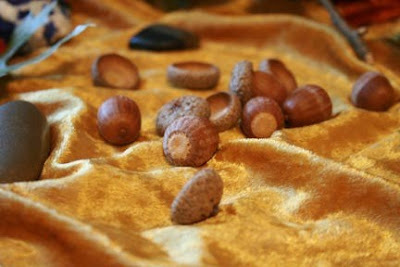 We left our samples with them to remember us, and we brought theirs home for our nature table. The fabric is a velvety fabric I found in a remnant bin at a fabric store about a year ago with the nature table in mind. I'm on the lookout for sweet gum "balls." They look like a cross between pine cones and cherries on a stem. I haven't found any in Kentucky yet. Cute! Just told my son today that we needed to go on a nature walk this afternoon and fill a bag with things we find outside! He loved that idea! This is a great blog entry. 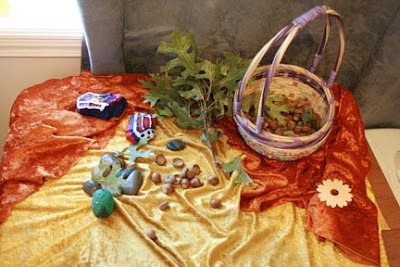 I too always had nature tables at my Grandmother Lovejoy's house. Now I carry on the tradition with my family and I also included it in my newest book, which will be out in January. I hope that many more families continue this tradition.